We are all familiar with PL Travers’ no nonsense British Nanny Mary Poppins, whether we encountered her in the original books or were a fan of the 1964 Disney classic starring Julie Andrews. 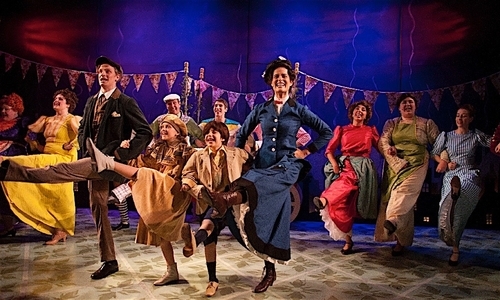 Now an Olivier and Tony Award nominated musical adaptation, with music by Richard and Robert Sherman, Stiles, and Drewe—and a book by Julian Fellowes—brings even more colour to the lives of the Banks family at the Lower Ossington Theatre. Opening on a star-lit silhouette backdrop of London, England, I wondered how you could tell the story on a seemingly small and bare stage, and so when it opened out like a story book onto the Banks’ family home—to little gasps from the young audience (and myself)—I was confident the production would have at least some of the magic I wanted it to. For die-hard Poppins fans, almost all of the Sherman brothers music from the film has remained intact, and the new songs by Stiles and Drewe fit seamlessly into the story and style. In fact there were so many songs that some could have been cut and the audience would still feel satisfied. Breanne Dietrich as Mary Poppins unsurprisingly has a voice that’s clear as a bell and a manner that some may describe as sassy in a Victorian England sort of way. Mitchell Court has the cheekiness of a classic Bert, but with a softness that was maybe missing from the film. Marina Bournas and Liam McAlpine more than held their own amongst the adults as Jane and Michael Banks, and I could have listened to Allison Wither sing ten more songs as the put-upon Mrs Banks. Outside of the Banks family, the story is populated by so many interesting and colourful characters played by the ensemble which include dancing statues, dancing toys, dancing chimneysweeps…there was a ton of dancing, and beautiful singing! The ensemble had so much power and energy, whether they were tapping through ‘Step in Time’, or simply crossing the stage with a stroller. Whilst the story doesn’t stray too far from that of the film, it somehow felt a bit disjointed, and more like a series of vignettes than one coherent tale. Maybe it was because of the limitations of space and staging. Maybe in a bigger venue it would feel more seamless. To snap through is maybe a better way of engaging the young audience, rather than expecting them to sit through longer scenes. There were definite dips in energy, and you could feel little audience members fidgeting and getting restless, but it wasn’t long before they were won back round with a big cast dance number. One problem I did have was with Julian Fellowes’ book, in particular the character of Mrs Banks. In the film she is at the front of the Suffragette movement but in Fellowes’ adaptation, Mrs Banks is no longer fighting for women’s rights, but rather is an ex-actor who quit the profession out of embarrassment and to look after her husband, and exists purely to host parties for his acquaintances and bear the brunt of his temper. I cannot offer an explanation why. It seemed very unnecessary and rubbed me the wrong way. Allison Wither was great, and I wanted more for her character. I went in as a bit of a cynical adult. The Sunday afternoon audience was mostly parents and their young children, and although I love the music and story of Mary Poppins, I was ready to simply consume the show rather than really enjoy it. Within seconds the child in me got so excited and it didn’t take much for me to give over to the sheer joy of it all. I was just as excited by the magic as the little girl next to me, who was astounded, and gasped and whipped her head in amazement throughout. She was excited for each of the songs she already knew, and swayed and danced along to those she was experiencing for the first time. It is impossible not to get stirred up by this production of Mary Poppins. It is everything you want from a classic family musical, and I challenge anyone not to leave the theatre singing every song and talking in a perfect British accent. Thanks for the treat review! How long was the show?